Before Swiss agents rolled up on Zurich’s Baur au Lac hotel, snatched a handful of top FIFA execs, and put in motion the series of events that would culminate in their president’s resignation, soccer’s governing body seemed pretty much omnipotent. That day has changed, thankfully, and people are making moves. The newest challenge of FIFA’s authority comes from Spain. FIFA, you may recall, decided to move the World Cup, traditionally a summer (in the Northern Hemisphere) tournament, to the winter for the 2022 edition after Qatar finally dropped that ruse about inventing newfangled air conditioning technology that would make playing soccer in 110 degrees tenable. Many observers believed the best chance of convincing pre-scandal FIFA to take away the World Cup from Qatar was for Europe’s confederation to balk at interrupting their mega-popular leagues. Unfortunately, UEFA was also in awe of FIFA’s power and acquiesced. 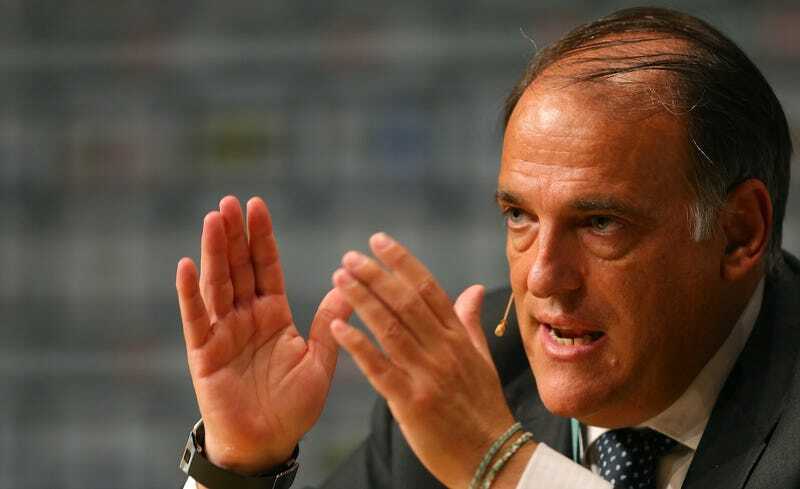 According to As, Tebas submitted three independent expert reports to CAS which concluded that the LFP would lose 65 million euros ($71.6 million) by moving the World Cup to the winter. Who knows if this will work, and/or if it inspires other European nations to join in on the action. The confederation itself probably isn’t too keen on re-litigating the subject, in no small part because of UEFA president and favorite for the FIFA gig Michel Platini’s close ties with Qatar. The important thing, though, is that with FIFA’s current predicament and the unending stream of bad publicity pouring out of Qatar, people are seeing the opportunity to make some changes. It might not be for the “greater good” or whatever, but it’s better than what we have now.